What do eSports, blockchain, psychedelics, and Cambridge Analytica whistleblower Christopher Wylie all have in common? They are all being featured at the upcoming Extraordinary Future Conference, in Vancouver, September 19-20. 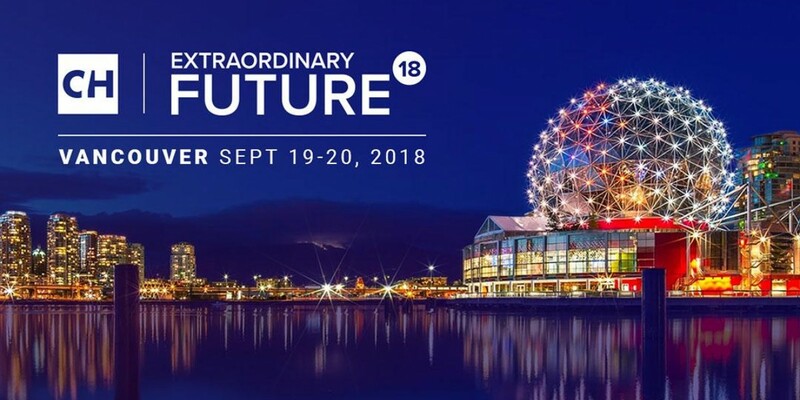 Extraordinary Future is returning to Vancouver Convention Centre East to showcase Canada’s hottest investment opportunities and elevate Vancouver’s technology sector to a level of international recognition. “Our mission is twofold - first, we are here to connect Canadian technology entrepreneurs with capital. We expect over 1,500 investors in attendance next week. Second, we are putting a spotlight on Vancouver’s ultra vibrant technology sector. Attendees will get the chance to see and hear from world class speakers and companies who are reinventing industries, and creating the products that will disrupt all of our lives.”- Jay Martin, CEO, Cambridge House. Not only will some of the biggest names in tech be gathering to inspire and educate, but a highly anticipated ‘Off the Radar Pitch Competition’ will hold the key to million dollar opportunity for some of the most up and coming companies in Canada including Diabits, HopKidz, and CareTeam. Controversial debates will be held across three stages to cover prevalent topics investors can capitalize on including blockchain as proof of business, cannabis delivery systems, data harvesting and privacy, quantum computing and health technology. It’s no question that eSports has become a global phenomenon, it’s set to become a billion dollar business with a global audience of over 300 million fans (http://www.visualcapitalist.com/business-of-esports/). Extraordinary Future will host two eSports panels to share the latest insight on trends, investment opportunities, and what’s to come. Participants include Dan Cybak (MyEsports Ventures Ltd. and The Gaming Stadium), Daniel Japiassu (YDreams Global), Genevieve Roch-Decter (Grit Capital), Julia Becker (Enthusiast Gaming), Anthony Brown (AMPD Game Technologies), Sam Chandola (Goleague), and Darius Egdhami (Fansunite). Curious about psychedelic therapy? Hamilton Morris, Star of VICELAND program “Hamilton’s Pharmacopeia”, will be on stage for an engaging fireside chat on the future use and application of psychedelic treatments in the US - a concept that could become far more controversial and disruptive than the legalization of cannabis. In addition to a wide range of groundbreaking speakers, over 60 of the hottest tech companies will be exhibiting throughout the two days providing the chance for attendees to see and experience firsthand the latest innovations and investment opportunities in Canada. Extraordinary Future is a podium for Canada’s most exciting entrepreneurs and companies, providing the ultimate opportunity to connect with available financing options and stay educated on what lies ahead. In a world that is constantly evolving, this event is sure to inspire, connect, and provide valuable insight to best answer the question, what future are you investing in? Register now and save 50% with promo code "CHXF" before September 14th!